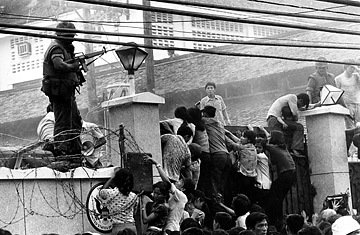 Mobs of Vietnamese people scale the wall of the U.S. Embassy in Saigon, Vietnam, trying to get to the helicopter pickup zone, just before the end of the Vietnam War on April 29, 1975. Politically, President Bush has reached the point all gamblers fear: being so far down that higher stakes start to look worth the risk. Public support for his handling of the war in Iraq is already abysmal, with 70% against him and only 25% still in his camp. So perhaps he felt he had very little to lose when Wednesday, in a speech to the Veterans of Foreign Wars in Kansas City, Mo., he effectively doubled down, arguing not only that America needs to stay in Iraq until a stable democracy can take root, but also implying we should have done the same in Vietnam a generation ago. The speech marks the start of a weeks-long campaign in the run-up to the politically charged September report card to be delivered to Congress by General David Petraeus and Ambassador Ryan Crocker. Bush will give a second speech next week at the American Legion in Reno, Nevada, and another a week later on a trip to the Asia-Pacific Economic Cooperation summit taking place this year in Sydney, Australia. The speeches will coincide with the launch of a $15 million ad campaign by a group called Freedom's Watch  which counts former Bush press secretary Ari Fleischer as one of its founders  aimed at bolstering flagging support for the war. Both Bush and Freedom's Watch, which the White House says is operating independently of the Administration, will attempt to cast the war in Iraq as another in a long progression of noble American efforts to bring liberty to benighted regions of the world. Bush wants to show, says counselor Ed Gillespie, that, "we have done this kind of transformative work before and the benefits to America made the sacrifices worthwhile." Those arguments intend to capitalize on momentum created by the reports of recent military progress on the ground in Iraq, and to blunt criticism of the lack of political reconciliation to accompany it. In that sense, the speech Wednesday was textbook Bush, contrasting optimistic promises of regional liberty with warnings of an ever-expanding threat should America lose in Iraq. But the comparison to Vietnam took many observers by surprise, seeming not only inapt but also unnecessarily risky. Why undermine the historical arguments about Iraq with the specter of the Vietnam quagmire, especially after the President had gone out of his way several months ago to reject critics' charges that Iraq was turning into just that? Bush said the loss in Vietnam showed there were both humanitarian and strategic reasons for staying in Iraq. "One unmistakable legacy of Vietnam is that the price of America's withdrawal was paid by millions of innocent citizens, whose agonies would add to our vocabulary new terms like 'boat people,' 're-education camps' and 'killing fields'," he said. "There's another price to our withdrawal from Vietnam, and we can hear it in the words of the enemy we face in today's struggle  those who came to our soil and killed thousands of citizens on September the 11th, 2001." Bush then quoted top al Qaeda figures citing the U.S. retreat from Vietnam as both an example of American weakness and a goal to aim for in the Middle East. "Here at home, some can argue our withdrawal from Vietnam carried no price for American credibility, but the terrorists see it differently. We must listen to the words of the enemy." White House aides speaking on background insist Bush, who even made a curious reference to Graham Greene's classic novel of American misguided idealism, The Quiet American, was not trying to "relitigate the Vietnam war." "We understand that people might be surprised by his using that example, but it's for a very specific purpose," said one White House aide, "which is what were people saying about what would happen if we left [Vietnam] and what are people saying about what will happen if we leave Iraq? The Vietnam war has been analyzed every which way and that's not what he was trying to do, he was trying to deal with the current debate we're in now, weighing the consequences should America walk away from its commitment in Iraq." Democrats leapt on the comparison with Vietnam. Senate Majority Leader Harry Reid's office sent out a lengthy release pointing to past efforts by Bush and other Republicans to distinguish Iraq from Vietnam, attacking his handling of Veterans' Affairs, and arguing that despite the military progress Iraq is not becoming more stable. "The Iraqis are no closer to political reconciliation and the President's Iraq policy is not working," Reid's statement said. "President Bush should stop politicking and work with Congress to change direction in Iraq so that we can start bringing our troops home and ensure that our valiant veterans receive the care they deserve." But Bush, bolstered by the relatively good news from Baghdad, appears to be in no mood for compromise. The President looked as comfortable as ever delivering his favorite tropes Wednesday. He beamed as he said, "The greatest weapon in the arsenal of democracy is the desire for liberty written into the human heart by our creator." He leaned in for emphasis when he said, "A free Iraq will be a massive defeat for al-Qaeda. It'll be an example that provides hope for millions throughout the Middle East. It'll be a friend of the United States, and it's going to be an important ally in this ideological struggle of the 21st century." In the end, it is the familiarity  critics would say the lack of credibility  of those themes that provide the answer to Bush's risky invocation of Vietnam. He has so often emphasized the disastrous ramifications of failure and the potential glories of victory, they no longer hold the same currency with a war-tired public. So, given how low support for the war is, why not add the specter of Vietnam to the costs of defeat? And why not suggest that victory in Iraq could help expunge the indignity of America's loss in Vietnam? Petraeus and Crocker will say what they will regardless of Bush's assertions, so raising the rhetorical stakes in the hopes of bolstering political support ahead of their report is the only card Bush has left to play.